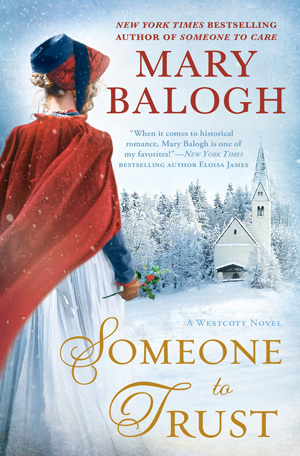 SOMEONE TO TRUST by Mary Balogh is a good addition to the WESTCOTT series, reuniting fans with beloved characters of past and present during the holidays. Elizabeth, Lady Overfield, is considering marriage for the second time. A widow, she wants someone serious and steadfast. A reliable, quiet man to possibly start a family with. But she also enjoys some harmless flirting with Colin Handrich, who inherited the Lord Hodges title after the death of his father. He’s ready to begin a family of his own after witnessing the happiness of the Westcott family during the holidays. Will this season bear fruitful for both as they encourage each other’s search? 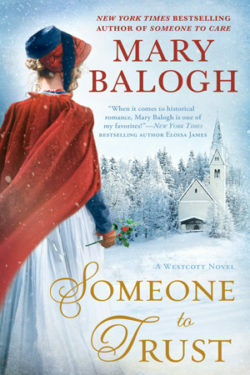 Mary Balogh is one of my favorite authors, and one of the few authors who will get me to read the Regency era in fiction, so I look forward to everything she writes. This book is classic Balogh in so many ways. Her house parties and balls are divine, with everyone talking at once in a blended chaos. It’s so easy to picture the scenes in my head, and I especially loved the attention to detail during the dancing. I really felt as if I was on the sidelines watching it all play out. I especially loved this couple in the beginning of the novel. Their attraction sparkles and you can feel it, as well as the denial due to their age difference. Should they even consider a relationship with Colin nine years younger than Elizabeth? I know it shouldn’t be frowned upon because it’s not highlighted when the man is older than a woman, but it’s just as true today as it was then, at least in my mindset. I have a hard time accepting that arrangement in a romance, and yet, Balogh made it seem plausible and enticed me to desire their success. That said, I’m not sure how the beginning of this novel will work for a new reader without the benefit of reading the rest of the series. As an avid fan, I found the beginning pages overwhelming and a little snoozy. I wanted some action, and we float along through all the characters’ introductions, which although necessary for my forgetful brain, seemed like a huge chunk. That’s not how I normally feel about the beginning of a Balogh novel, so it surprised me. Not that I would stop reading it because of that, but for a new reader, it’s not representative of this author’s true magic. Lady Hodges, Colin and Wren’s mother, is a ridiculous woman—a worst nightmare image of a wealthy spoiled brat. I felt sorry for Colin to have her as a mother, but even sadder for Wren for what she endured because of that woman. Colin grew up with his mother, and so it might be easier for him to forgive her, but Wren was estranged from her entire family because of the mother who couldn’t accept her disfigurement. Lady Hodges was the only part of this novel that I couldn’t relate to, and I found most interactions with her distasteful, as well as over-the-top ridiculous. I enjoyed this novel, but it isn’t my favorite of the series. I laughed out loud at some situations and tears formed at others. I was shocked at one situation and thrilled that Avery (one of my favorites from a previous book) was very much himself at that moment—lethal but holding back to allow the situation to resolve itself, even though he’d be justified to do something about it. Balogh is brilliant at writing the chaos of family and their good intentions, then amps it up a bit to make me laugh again. It’s a long book that has an enormous number of scenes and situations. The work involved creating something of this magnitude is mind-boggling, so I appreciate the endeavor beyond most books I read because of the volume of characters and their interactions. It’s really astounding how well it flows. I think what bothered me most is that Lady Hodges took up too much page time for my taste. She seemed almost like a fairy-tale caricature of a wicked stepmother rather than a real person. That she was a mother to several children just turned my stomach. If I didn’t love the rest of the characters as much as I do, I would have stopped reading because of how annoyed I became with Lady Hodges. I did love all the family time, but by the end I was ready for Elizabeth and Colin to move on without them. The end of the book did contain some appreciated humor, but I wanted a bigger glimpse into this couple’s future. Even though this book isn’t my favorite of the series, it was still a beautiful romance. I like that their journey was difficult and unusual, which made me appreciate their happy-ever-after more. My favorite part of the book was the heroine and how everyone rallied around her. I especially appreciated how she loved them for their support but was strong enough to face down her demons on her own. Colin was not her backbone, nor was she his, but hand in hand they could move forward, knowing they could rely on each other to trust in themselves, independent yet making each other more comfortable to forgive their past. Enough to accept and look forward to their future. Neither of them had an easy life, so their life together would have to make allowance for their combined pasts to interfere sometimes. SOMEONE TO TRUST gifts us with a second chance for an older woman with a younger man. The love story is believable and entertaining. I enjoyed their playful interactions and how they try to find someone else that will suit them better. There were so many cute moments between them that made me hopeful for their happy-ever-after. I especially enjoyed the holiday scenes and the fun in the snow, as well as the numerous gatherings and balls they both attended. This book was filled with party-time and very festive. Just what I look for in a story that’s centered around family celebrations. I suggest you read the series in order prior to this book for the most enjoyment. Click on the following titles to read my reviews of the books in order: SOMEONE TO LOVE, SOMEONE TO HOLD, SOMEONE TO WED, and SOMEONE TO CARE. It’s one of the best series I’ve read.